“If your pet suddenly becomes disabled, there is a huge learning curve to master in a very short time. Local resources and information are limited, so we try to share our experiences in order to help get you the information you need as quickly as possible,” said Lizotte. The topics in the one-hour presentation will include tips and advice about caring for and communicating with senior and special needs pets that are blind or losing their sight, deaf or losing their hearing, paralyzed or mobility challenged, or incontinent. “Special needs pets are just different, not less. Old wisdom was to euthanize a disabled pet, not anymore. 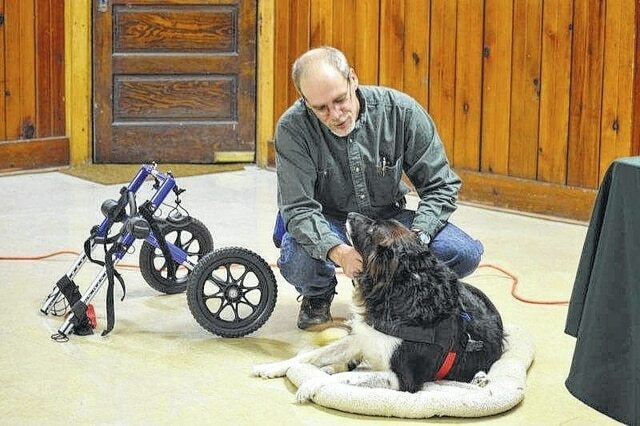 They lead happy, normal lives with the proper care and opportunities,” Lizotte said. Rescued Rollers will bring a selection of items commonly used in the care of senior or special needs pets, including: a wheelchair for dogs, lifting harnesses, boots, incontinence products and more. “There will be a 30-minute discussion period where you can ask questions regarding the care of your senior or special needs pet,” Lizotte said. Lizotte founded Rescued Rollers last year, after his and his wife, Noel’ experience in adopting a special needs dog, Ranger. The couple has several other pets and recently adopted a blind and deaf dog named Hope. For more information, visit the 501(c)(3) non-profit Rescued Rollers at www.RescuedRollers.com or on Facebook at www.facebook.com/RescuedRollers, email John Lizotte at John@RescuedRollers.com or give him a call at 419-631-3927.